The room 74 of the New Uffizi is dedicated to Francesco Mazzola, known as Parmigianino (1503-1540). The artist was born in Parma (hence his nickname) and is considered an important exponent of Italian Mannerism. In this Uffizi room there is the Madonna with the Long Neck, one of the most famous paintings by Parmigianino. It is a large oil painting on wood, made around 1534-1540, for the church of Santa Maria dei Servi in Parma. After many vicissitudes, it arrived in Florence in 1698. However, the work was also in Paris, from 1799 to 1815. It was taken to the French capital during the Napoleonic lootings. 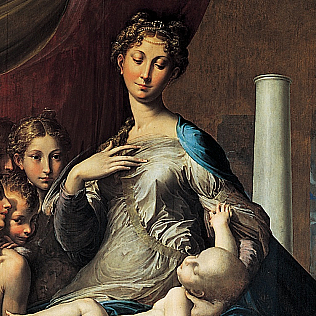 The Madonna With The Long Neck represents the break of the Mannerist style with Reinassance, hence its importance in Italian art. The human figures have unnatural proportions, they are very elongated. Even the colors are new, not very compact. The balance and the serenity of the Renaissance figures do not exist anymore. Among other works by Parmigianino at the Uffizi, we remember the Madonna and Child with Saint (called the Madonna di san Zaccaria), an oil painting on panel, present at the Uffizi since about 1605. Even this painting depicts characters and space that are not naturalistic and - somehow - a little mysterious. The room 74 is on the first floor of the Uffizi Gallery.